Awami National Party (ANP) whose history is full of hatred for Pakistan and Anti Pakistan works. it is showing its hatred for Pakistan and Islam once again. Leaders of Awami National Party (ANP) has given some statements that are enough to Expose them. Haji Adeel of ANP has recently said in a Newspaper column that our hero is Gandhi and Raja Dahar not Jinnah and Ibn Qasim. Bashin Ahmed Bloor said word Islamic must be removed from name of Pakistan. Another Bloor of ANP said that Non-Muslim must be allowed to become President of Pakistan. Even you will never see ANP leaders saluting Pakistani flag. 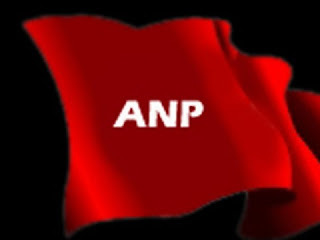 Recently ANP has created a new Dispute by changing the name of NWFP to Pakhtun Khawa due to which People of Hazara are really unhappy and demanding a separate Province. ANP also came into Government for the first time with the American support. When NRO deal was going on between PPP and Americans it was also decided that ANP will be brought in Government in NWFP.